The following items are included standard in the purchase of TigerBoard. One TigerBoard circuit board assembly. SPI master with programmable line rates up to 50Mbit/s. SPI slave up to 25Mbit/s. Programmable line rates up to 6.25Mbit/s. Windows 2000/XP/Vista/Win7/Win8, Linux or Mac OS X. The electronics of the TigerBoard is powered through the USB connection. No separate power supply cable is needed. The TigerBoard circuit board assembly is 90mm x 60mm. 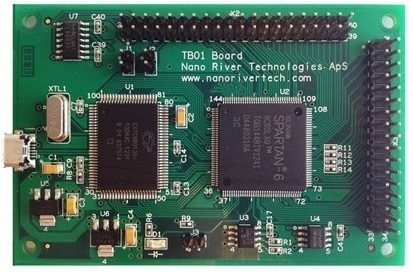 Nano River Technologies TigerBoard has been designed specifically for test purposes. It is not designed or guaranteed for integration into user’s products. Nano River Technologies takes no responsibility should the user choose to integrate TigerBoard into products. Nano River Technologies takes no responsibility for damage caused through use of the TigerBoard.